Sometimes I’m lucky enough to notice that the bees when the bees just begin to swarm and are swirling around our backyard. Whenever possible I stand in the middle of the yard and listen to the hum of thousands of bees. Sometimes I’ve done this and watched them, not form a football-shaped ball around a queen, but return to the very hive they poured out of. This is an amazing sight for a few reasons. One is how quickly the message to return gets disseminated amongst the bees. One moment there is what appears to be chaos with bees flying in many directions and landing on many plants (and me). The next they have all returned to the hive. Throughout all of this the bees not involved in the swarm continue about their tasks. The bees somehow communicate with each other and manage to not run into their sisters. Hive entrance busy with bees returning from a swarm. 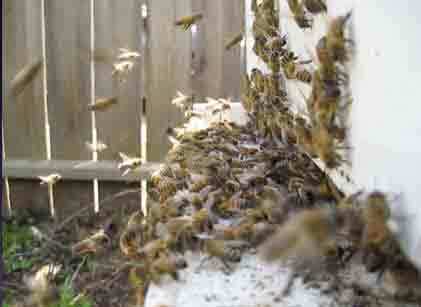 The first photo shows of a busy hive entrance. There are bees returning with pollen and other bees leaving to gather the goods, as well as bees returning from a sort of practice swarm flight around the garden. Swarms happen in Spring – but what happens is open to interpretation. Inside the hive the bees raise new queens. One of these new queens rises to power inside the hive by fighting and killing off her rivals. However she doesn’t kill the old queen. Some experts say the bees know when the old queen is running out of eggs and kick her out. However, she may choose to go… she certainly does not go quietly. Instead the old queen takes enough bees with her to start up a new hive or colony. our neighbors was home and she granted us permission to go into the back. For this she will be rewarded with much honey. 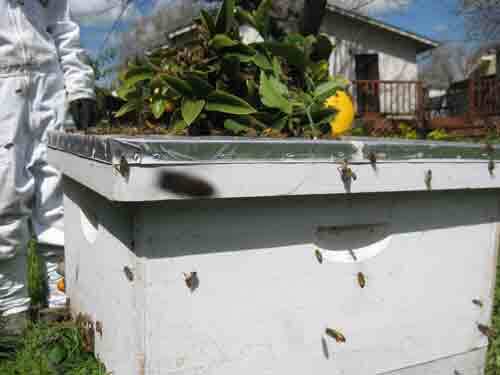 To gather this swarm, we put an empty hive body on a wagon, and rolled it over to the neighbor’s back yard. Here we shook the branch the bees were on and caught the majority of the bees in a hive. Then we restricted the entrance with grass. The hope was that we caught the queen. A few bees took flight when we shook the branch and then resettled on the lemon tree. We trimmed the small branch they had settled on and placed it on top of the hive. Then rolled the hive back to our yard. 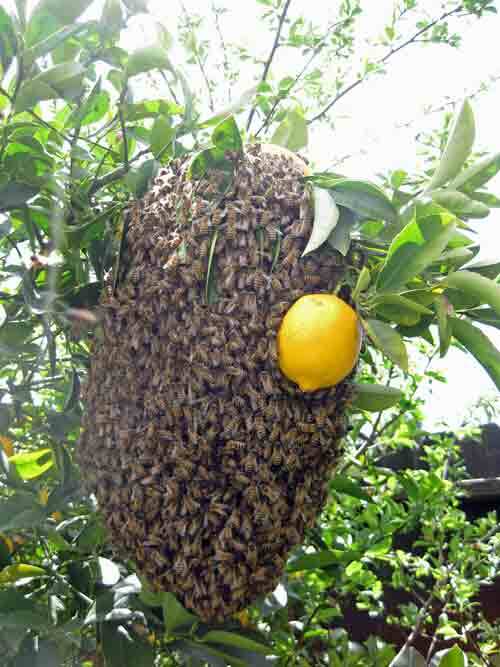 Hive houses a swarm with lemon branch on top.